Google often talks about how it wants to make any app you use in your car the safest possible, which means less time looking at the screen and more time looking at the road. 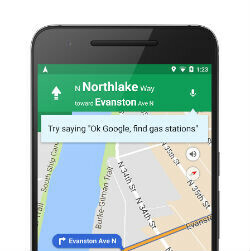 The simplest way to make that happen is with hands-free voice controls, so Google is greatly expanding the navigation commands available by voice in Google Maps. "Show route overview." or "Show alternate routes." "How's traffic ahead?" or "How's traffic to home?" "Send a text to [contact]"
That's an in-depth list that should cover most, if not all of what you might want to do while driving. The update is a server-side toggle, so it is rolling out to users now, but it may take a couple days to hit your specific device. Let us know below if you're seeing the new commands available for you.